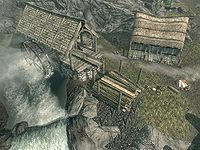 Dragon Bridge Lumber Camp is a sawmill and lumber camp in the southwestern part of Dragon Bridge. It consists of one zone, Dragon Bridge Lumber Camp. The building consists of a ground floor and a basement. 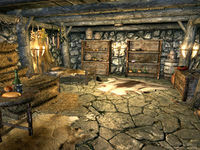 On the ground floor, a double bed owned by Lodvar can be found on the east wall, flanked by a non-respawning unlocked chest containing leveled items on the left and a small table on the right. The table holds two bottles of alto wine and five loose gold coins. Another bottle of alto wine lies on its side near the foot of the bed. A set of shelves on the north wall holds a bottle of wine and three bottles of alto wine. 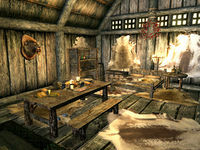 A respawning food barrel sits in the southwest corner, and at the center of the room is a large dining table holding two goat cheese wedges, one eidar cheese wedge, three loaves of bread, a bottle of alto wine, a pine thrush egg, and two pieces of salmon meat. Beneath the table are two chicken's eggs. In the basement, a respawning food barrel can be found beneath the stairs, along with another on the north wall nearby. A small table holds a goat cheese wedge, a loaf of bread, a pine thrush egg, and a bottle of wine. Between the barrel and table, a hanging rack above holds four freshly caught pheasants. Across from the table, on the south wall, four non-respawning sacks lie on the floor. Next to the sacks is a non-respawning dresser with a lute and an iron mace sitting on top, a pickaxe on the floor to the right, and a large respawning sack to the left. Another respawning food barrel can be found in the southeast corner, next to a set of shelves holding miner's clothes and an iron dagger on the top shelf, a common soul gem, five gold coins, and a saw on the middle shelf, and two bottles each of wine and alto wine on the bottom shelf. To the left of these shelves is a non-respawning cupboard which holds copies of the books The Holds of Skyrim, Of Crossed Daggers, Herbane's Bestiary: Ice Wraiths, and Alduin is Real, along with two loaves of bread, a bottle of wine, and a bottle of alto wine. A single bed, also owned by Lodvar, is situated with the head along the north wall. At the foot of the bed is a pair of miner boots, and a small non-respawning unlocked chest containing leveled items sits to the left side. Above the bed are some hanging ingredients, including two garlic braids, one dried frost mirriam, and two portions of dried elves ear, as well as a hanging rack holding three freshly caught rabbits. The front door has an apprentice lock, the key to which is carried by Horgeir. Sawn logsHF cannot be purchased at the lumber mill here. There is a non-respawning pot located at the fire near the wood chopping block. All cupboards, end tables, and dressers in the area are non-respawning and safe to store items in. This page was last modified on 8 October 2016, at 03:40.